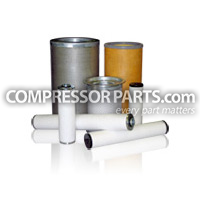 Our Atlas Copco Oil Filter Replacement - 1613610590 is a high performing filter that will meet or exceed OEM specifications and is composed of specific filter elements for high performance. This 1613610590 Atlas Copco oil filter features high-grade filtration efficiency, temperature resistance and resistance to synthetic oils. Our Atlas Copco Oil Filter Replacements are built to have exceptional service life and withstand high operating pressures.